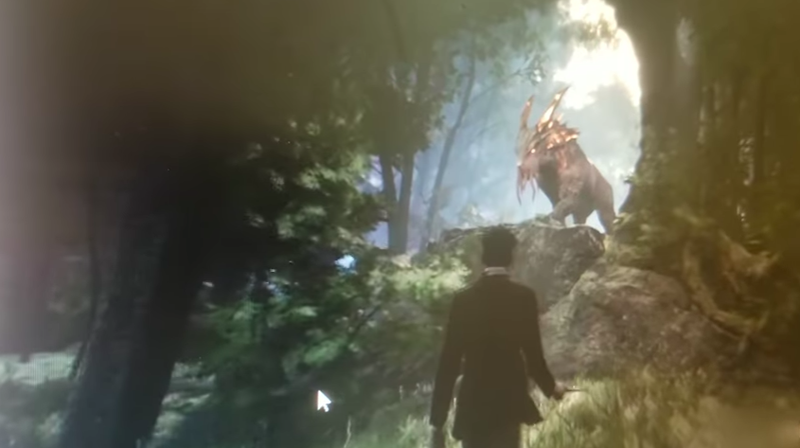 The leaked Harry Potter game shows a wizard in the Forbidden Forest, confronting what appears to be a big nasty creature. A video, leaked this morning by a Reddit user who says they captured it from a focus group, shows an apparent big-budget Harry Potter game that looks fantastic. Publisher Warner Bros. has yanked the video from YouTube, but you can watch a mirror here. The footage shows, among other things: Wizards in Hogwarts academy casting spells, alchemical experiments, owls and magical beasts, and even a glimpse of the whimsical village of Hogsmeade, located right near Hogwarts’ campus. The Reddit leaker, who goes by VapeThisBro, describes the game as a third-person open-world action game in which you customize your own wizard, a fifth-year student at Hogwarts. An unidentified wizard casts spells in a Hogwarts class in apparent leaked footage from a new Harry Potter game. Is this a brand new Harry Potter video game for next year or even the next generation of consoles, which we expect to see released in 2020? Only time will tell.